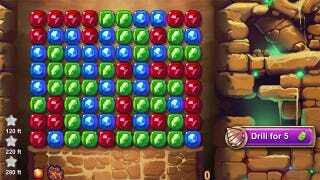 Ruby Blast, Zynga's color-matching game that started life as a shameless clone of Bejeweled's Diamond Mine mode, has transformed itself into a shameless Diamond Mine clone with a difference, adding an extensive adventure mode on top of its regularly scheduled weekly tournaments. Ruby Blast's quietly implemented adventure mode (which I heard about via Games.com) adds a series of themed levels with three set depth objectives. Each depth marker is worth stars, which are used to unlock subsequent levels. Along the way players can uncover random treasure chests, collect artifacts and keep track of their friends' progress with markers a ‘la Bubble Witch Saga. A little added depth (pardon the pun) goes a long way. I'm close to halfway through the first Egypt-themed set of levels right now, and I'll likely be spending a lot more time playing Ruby Blast in the weeks to come. Nice move, Zynga.